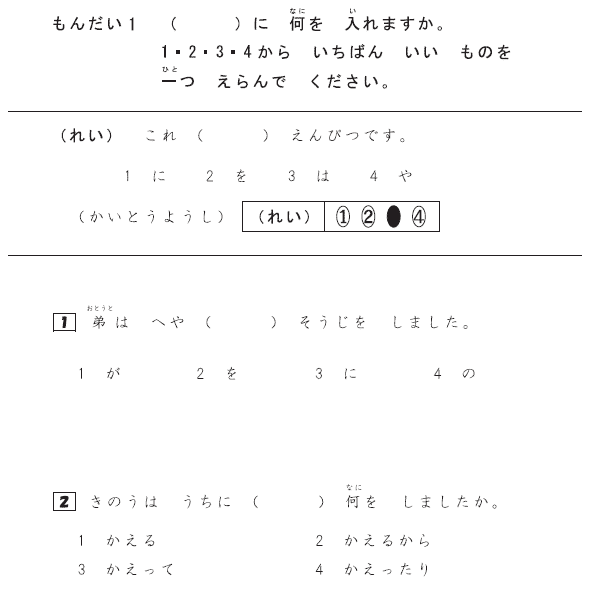 JLPT organizers have made practice tests available online ever since they changed the format back in 2010. These ‘tests’ aren’t actually complete. A lot of the sections only have 2 questions whereas the real test may have 5 or more for each. I have added some comments to the practice tests that you can pick up for all the levels – N5, N4, N3, N2, N1. There are also full-sized workbooks that are about the same size as the real test available for all the levels – N5, N4, N3, N2-N1. You can also take the practice test online for N5 level. In this first part of the grammar section you must choose the appropriate grammar point that will fit in the sentence. 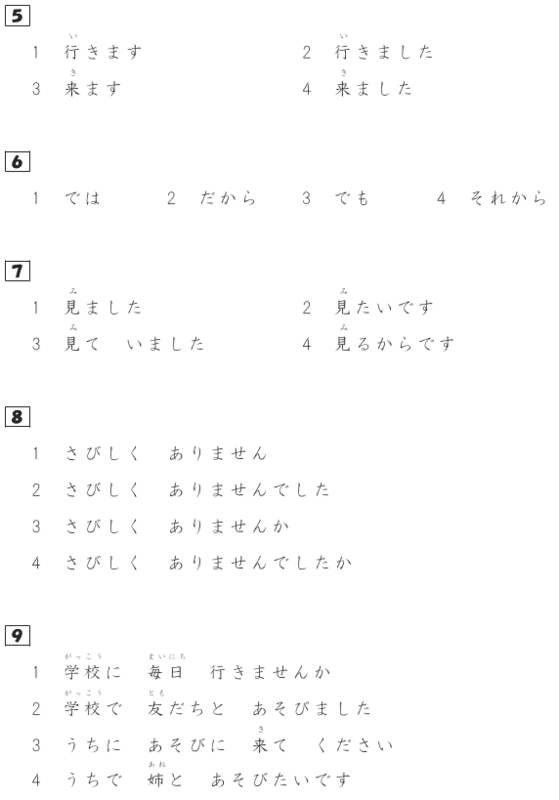 About the first 5 of the 16 questions will be about single-mora particles (も, が, を, etc..). The rest will be a mix of multi-mora particles (だけ, しか, ぐらい, ごろ) as well as forms (e.g. past vs. present continuous) and phrases. 1) 4 – の. Your first reaction might be to choose #2 を, the object marking particle. Generally speaking, in well-formed sentences at this level, you are not going to see two を particles in the same sentence. They do exist, just not in simple sentences like this. I’m going to the room. As for my brother, the room did the cleaning. 1 – かえる can not be used in front of 何 like this, you could use it in a clause before a noun, but not here. Right after (I) returned home, (I) took off my shoes. shuumatsuwa hono yondari terebio mitari shimasu. On weekends, I read books, watch TV and stuff like that. In the 2nd part of the grammar section of the exam, you will see the scrambled sentence questions. These seem a little complicated at first, but once you get used to them, they are not that bad. Basically, you need to unscramble the answer parts and place them into the blanks. The answer you mark on the mark sheet is the one that goes where the star is. ３）2 – (1423). Looking at the answers you see the casual past tense of とる – とった. This needs to go in front of a noun to make a clause. You can’t take an ocean, so it probably goes in the last position in front of しゃしん. korewa kyonen watashiga umide tottashashindesu. This is a picture I took at the ocean last year. ４）１- (2413). Quickly looking at the answers we see 行いきました. Since it is in polite form, we can make a guess that it will either be at the end of the sentence, or it may go in front of a conjunction like から, ので, or が. Since there are no conjunctions here, we can assume it will go at the end. Remember the structure “V-masu + に + 行いく”? You can use it to show the purpose of going somewhere. In this sentence, we literally went to shopping. kinou, nihongono jishouo kaini ikimashita. Yesterday, I went shopping for a Japanese dictionary. 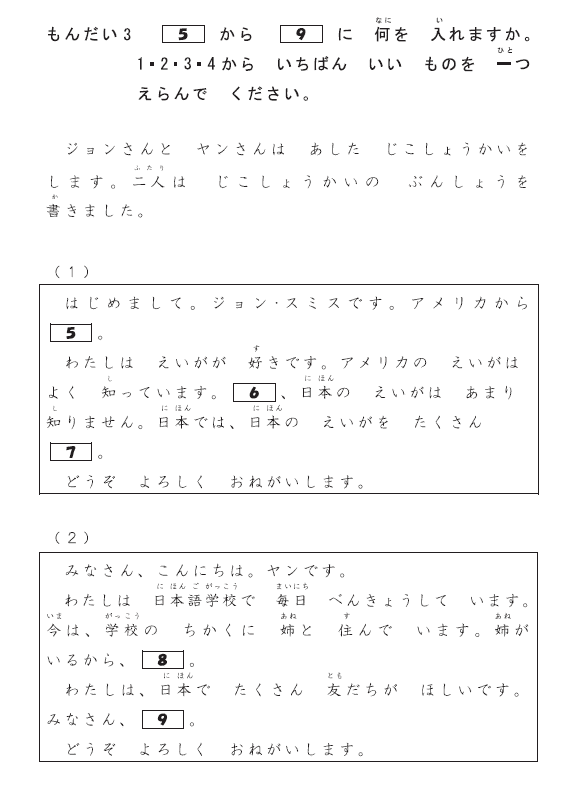 In the 3rd and final part of the grammar section of the test, you are giving a paragraph of Japanese text that you must choose the correct answers to fill in the gaps. The idea here is to give you more context and test your ability to see if you understand what forms fit into the particular context. This is something that language teachers sometimes call appropriateness. More than one answer might be grammatically correct, but only one answer is correct in this context. Also, when using the particle から (from), it isn’t common to use 行いく (to go), at least when introducing yourself. So, that only leaves 来きます and 来きました. We know the author is Japan, so they must have already came – 来きました. I know American movies well. I don’t know Japanese movies that well. To show a contrast between two sentences, we need to use でも (but). 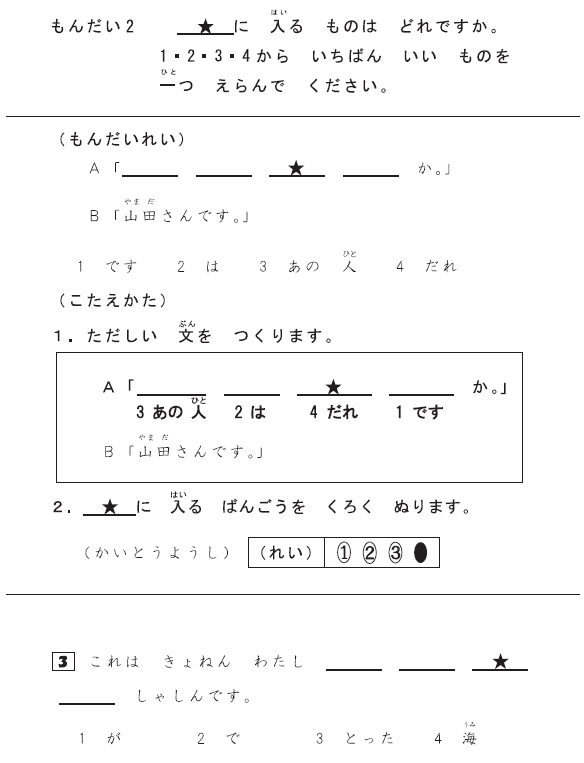 The other answers simply don’t fit here – では (well), だから (so), and それから (after that). nihonno eigawa amari shirimasen. nihondewa, nihonno eigao takusan mirukaradesu. I don’t know much about Japanese movies. The reason is in Japan I’m going to see many Japanese movies. Doesn’t exactly make much sense, does it? ８）1 – さびしくありません. The author wouldn’t be asking the audience a question here. She is obviously talking about herself and her sister – 姉あね. So, we can eliminate the two answers with か. That just leaves us with the non-past sentence (さびしくありません) and the past sentence (さびしくありませんでした). Since all of the sentences before this one are in non-past, the non-past sentence makes the most sense. watashiwa, nihonde takusan tomodachiga hoshiidesu. In Japan, I want to have lots of friends. Why don’t you come to school every day? I had fun with my friends at school. I want to have fun with my older sister at home. For answer 1, you could make friends at school, but this sounds more like a request from someone that wants to learn. Answer 2 is talking about the past, and the author doesn’t seem to have so many friends currently. Answer 4 doesn’t seem very friendly at all. That is it for the grammar section of the N5 practice test. Let me know if you have any questions about the explanations. Be sure to comment below, so that I can help you out. Really helpfull, Thank you so much Mac. Hi there! Thanks a lot for doing that, I’m taking N5 in July and this is very useful. Your explanations are very clear, but did you forget to attach the possible answers in part 3, or am I missing something? Right, sorry about that. I updated the post to include the potential answers.